Contributors: Jason R. Ambroise, William Paterson University, USA Jason Ambroise is an Associate Professor in the Department of History at William Paterson University of New Jersey. His research fields include the history of “race” and its interconnection to other socio-human discourses of Western modernity; the history of the human sciences; and the history of biology/socio-biology. His teaching fields include nineteenth and twentieth century U.S. history, the history of science, and Black Studies. Previously published essays are titled “Rethinking ‘Race’: Biocentrism and the Origins of Our Time” (2004) and “Biocentrism, Neo-Ptolemaicism, and E.O. Wilson's Consilience: A Contemporary Example of ‘Saving the Phenomenon’ of Man, in the Name of the Human” (2006). He is currently working on a book-length manuscript entitled Instituting Order: On the Formation of Criminology in the U.S. Sabine Broeck, University of Bremen, Germany Sabine Broeck teaches American Studies, Gender Studies and Black Diaspora Studies at the University of Bremen. Her research critiques the coloniality and anti-blackness of transatlantic modernity as a social formation and culture of (post)-enslavement. She is President of the international scholarly organization Collegium for African American Research (CAAR), as well as director of the University of Bremen Institute for Postcolonial and Transcultural Studies (INPUTS); also, she is the convener and professorial mentor of the Black Knowledges Research Group at the University of Bremen, see http://www.bbs.uni-bremen.de/. Her two previous monographs are Der entkolonisierte Koerper (1988) and White Amnesia-Black Memory? American Women’s Writing and History (1999). She is currently at work on a book-length manuscript entitled Gender and Anti-Blackness contracted with SUNY Press. For more information, as well as selected publications, see http://www.fb10.unibremen.de/lehrpersonal/broeck.aspx or https://unibremen.academia.edu/sabinebroeck. Holger Droessler, Harvard University, USA Holger Droessler is a Ph.D. Candidate in American Studies at Harvard University. He received a Master of Arts in American Cultural History, American Literature, and Political Science from the University of Munich, Germany, in 2008. His current research centers on the history of the long and global nineteenth century, especially U.S. and European imperialism in the Pacific. In his dissertation, “Islands of Labor: Community and Resistance in Colonial Samoa, 1889-1919,” he explores the crucial role of workers in the making of empire in the South Pacific. Demetrius L. Eudell, Wesleyan University, USA Demetrius L. Eudell is Professor of History at Wesleyan University, where he specializes in U.S. history and the history of Blacks in the Americas to the end of the nineteenth century. In addition to a number of essays and articles on Black intellectual and cultural history, he is the also the author of The Political Languages of Emancipation in the British Caribbean and the U.S. South and co-editor with Carolyn Allen of Sylvia Wynter: A Transculturalist Rethinking Modernity, a special issue of The Journal of West Indian Literature. His current research project examines the role of ideas of history, nature, and human differences in the eighteenth-century Enlightenment with special reference to the German Aufklärung. Jason E. Glenn, University of Texas Medical Branch, USA Jason E. Glenn is the James Wade Rockwell Distinguished Professor of Medical History at the Institute for Medical Humanities at the University of Texas Medical Branch in Galveston. He is a co-founder of the social medicine program researching the structural determinants of health. His work focuses on the history of U.S. drug policy and mass incarceration, as well as the history of the production of biomedical knowledge. He also helped establish and administers the drug court for Galveston County, melding his incarceration research with community interventions. He is currently at work on a book-length manuscript entitled Addicted to War: Neoliberalism and the Corporate Merger of the War on Drugs with the Global War on Terror. Lubaina Himid, University of Central Lancashire, United Kingdom Lubaina Himid investigates effective ways for artists to broaden relationships with museums. Using the often hidden or neglected objects in collections, she works with curators to broker conversations between these objects, museums and audiences, bridging the gaps between the histories and contemporary life. During the past thirty years she has exhibited widely in the U.K. and internationally with solo shows that include Plan B at Tate St Ives. Her work is represented in several public collections including Tate, The V & A, ACE, Birmingham City Art Gallery, New Hall Cambridge, Whitworth Art Gallery and Manchester Art Gallery. She is currently Professor of Contemporary Art at the University of Central Lancashire. Chernoh M. Sesay, Jr., DePaul University, USA Chernoh M. Sesay, Jr. is an Associate Professor of Religious Studies at DePaul University. He is an historian who teaches historical and interdisciplinary classes concerning the relationships between transatlantic slavery, race, and religion. He also teaches classes on African American intellectual history, on the connections between politics and religion in American history, and on the philosophy of history via the juxtaposition of theological and secular approaches to historical thought. He is currently finishing a book-length manuscript entitled Black Boston and the Making of African-American Freemasonry: Leadership, Religion, and Community in Early America. He is published in the New England Quarterly and the Journal of African American Studies and is a regular blog contributor to the African American Intellectual History Society website, www.aaihs.org. Sylvia Wynter, Emeritus at Stanford University, USA Sylvia Wynter is an emeritus professor, essayist, novelist, and playwright whose life’s work comes out of two far-reaching social movements of the twentieth century – the Anti-Colonial Movement (which cut across her native Jamaica) and the Black American Fifties/Sixties Movement (which propelled her into the U.S. academy). 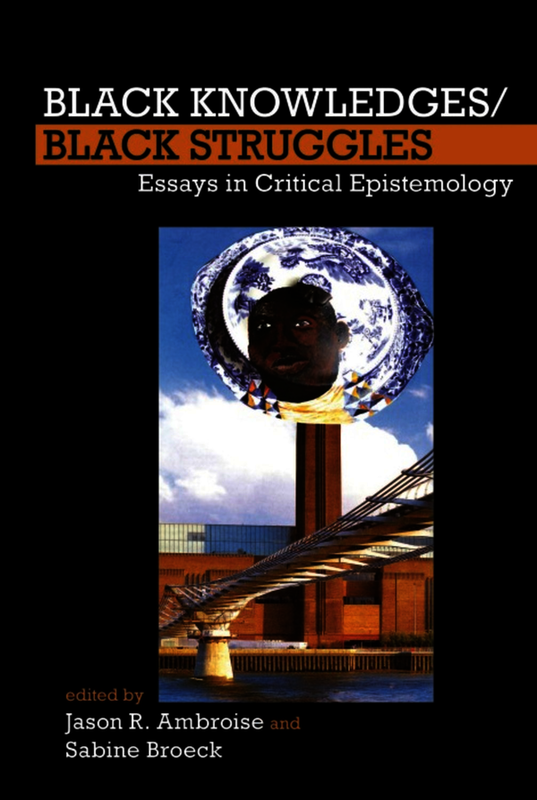 A former member of the (original) Institute of the Black World, her present intellectual work coalesces around her seminal proposal of a new definition of the human as a hybrid and uniquely third level of existence (beyond that of the physical and purely biological). Such a new definition, she proposes, would make possible the collective remaking of our contemporary planetarily-extended societal order in the new ecumenically-human terms required for our species’ continued survival and realization. She is currently compiling her multitude of published essays under two titles – We Must Learn to Sit Down Together and Talk About a Little Culture: Decolonizing Essays, 1967-1984 and “That the Future May Finally Commence”: Essays for Our Human’s Sake, 1984-2015. She is also the subject of critical genealogies of her work – the most recent entitled Sylvia Wynter: On Being Human as Praxis (2014), which includes an interview with herself and collection editor Katherine McKittrick. She is an Emeritus Professor of African and Afro-American Studies and Spanish and Portuguese at Stanford University (USA), with previous academic appointments as visiting professor in Third World Literature in the Department of Literature at the University of California at San Diego (USA) and lecturer in Hispanic Literature at the University of the West Indies, Mona Campus (Jamaica). In 2002 she received an Honorary Doctor of Letters from the University of the West Indies, Mona Campus; received the Order of Jamaica (OJ) award in 2010 for her services in the fields of education, history, and culture; and in 2012 was conferred as a fellow of the Institute of Jamaica. Prof. Dr. Jason R. Ambroise teaches in the Department of History at William Paterson University. Prof. Dr. Sabine Broeck teaches American Studies, Gender Studies and Black Diaspora Studies at the University of Bremen. She is President of the international scholarly organization Collegium for African American Research (CAAR) and the author of 'White Amnesia – Black Memory? Women's Writing and History' (Peter Lang, 1999). 7 Imaginary Black Topographies: What are Monuments For?